Samburu Girls Foundation – Empowering a Woman! We Fight for the girl child! We fight harmful traditional practices that affect the girl child among the Nomadic pastoralist communities. Acres donated by the community to build a rescue center. We strive to End harmful cultures. Child beading (aisho-ntoyie saen) is a major cultural practice found in the Samburu community. Samburu morans, young worriers aged 15-35 years, are not allowed to marry. Hence girls as young as 9 years old are assigned to male relatives by use of red traditional beads. The young girl is adorned with beads, signifying ‘engagement’ for sexual purposes only. The mother of the beaded girl builds a hut outside their manyattas where the male relative visits the beaded girl to engage in sexual activity at any given moment he wishes. Female Genital Mutilation/Cutting -FGM/C is recognized internationally as a violation of the human rights of girls and women. Despite the fact that FGM is illegal in Kenya; it is still widely practiced in Samburu, Isiolo, Marsabit and Laikipia counties. Female Genital Mutilation/Cutting can be defined as the practice that involves the partial/total removal of the external genital organs of a female for “customary or any other non-therapeutic reason. Globally, about 15 million girls are married off while young meaning a child is married off every 2 seconds. 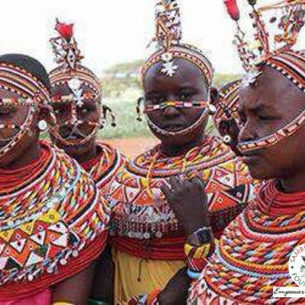 In Samburu, Isiolo, Marsabit and Laikipia counties, after girls have undergone FGM, they are expected to get married immediately the following day. The fact that they are still children does not exempt them from such a heavy responsibility. Marriage for girls can lead to complications in pregnancy and childbirth, one of the main causes of death of young girls aged 15-19 in Kenya. Your generous donation will touch a life. Help us do more, help us impact more lives, donate now.